Online computer backup provides an affordable, low maintenance, offsite solution for consumers and businesses. There is no media to change and no hardware to maintain. The backup is done through an internet connection using a secure and encrypted tunnel. With Sanders Software's Offsite SAN service you can backup and restore interactively 24/7 from your computer or server. You can setup your backup to run automatically on scheduled regular bases or you can manually run your backup. nobody, including our own staff, can access your data. connection (restored) from the storage center and returned to your computer. Offsite SAN is an online computer backup service. Using an existing Internet connection, it transfers encrypted copies of your most critical data to our secure remote storage vault. This is done automatically each night, on schedule, without end-user intervention. Implementing Offsite SAN is straightforward. The initial step is the installation of the online backup client software. Next, a backup set is created and important files and/or folders are identified. Finally, a backup schedule is selected. From that point forward, backups generally occur automatically, on schedule, without end-user intervention. The initial transfer of data to our Offsite SAN storage vault can sometimes take an extended time period. However, after a full baseline of data is transferred, subsequent backup jobs finish quicker - since they capture only files that have changed since the previous run. At the conclusion of each backup, an electronic mail message it sent which contains the results of the job. After you install the Offsite SAN software, you will simply leave your computers on at night. Offsite SAN "hides" in the background without interfering with any other program. The Offsite SAN icon appears on the System Tray. You can setup your backup schedule as you wish. You can select and exclude the files you would like to backup. At a predetermined time, Offsite SAN "wakes up" and determines which files need backing up, and what kind of backup (out of three possibilities) is scheduled for that night. It then compresses those files into archives that can in many cases be only 10% to 20% of the original file sizes. These archives are then encrypted using an encryption key known only to you. After the files are compressed and encrypted, Offsite SAN uses your Internet connection or other communications device and sends the files off-site to our remote backup server. Offsite SAN then verifies the files and goes back to sleep. Your valuable computer files are now safe off-site. If the building burns or your computer is stolen, your business can be saved by replacing the equipment and restoring their files from the Remote Backup Server. Below is the main Restore screen. The left pane contains a list of your named Backup Sessions. The ones with a plus sign (+) beside them have backed-up data associated with them. Click on the plus sign to open the Session List. Under each Session is a list of backup sessions that have been performed. They have the dates and times they were performed, in ascending order of oldest to most recent. Double-click on a session to display its contents in the right pane. As with the standard explorer interface, you can click on the plus signs (+) to open the tree view of the backup session to further explore it. Backups are encrypted for complete security. Tape backups are not generally encrypted, so anyone can read them and gain access to client database, billing records, payroll, tax info, and everything else on your computers. Our Version Control System keeps multiple copies of your files on our Server. Our system NEVER over-writes a file. If you want to restore a file from two weeks ago, you can, back to a specific date - as long as you still have that data on our Server. For example let’s say you work on a document on Monday, Tuesday, Wednesday, Thursday... Now let’s suppose it is Friday and you want to restore the document from Wednesday. No problem, you simply pick which version of the file you want. It’s just that easy. You can set your software to rotate files. It can erase the oldest backup files by the length of time they have been on our Server. So, if you like, you can set the system to delete all files that are 30 days old (as an example). This would mean that your Server would automatically erase data as it hit 31 days old and the latest session is written to the disk, effectively keeping the most current 30 days of data online. (or 14 days, or 60 days - whatever) Or, you can turn this feature off and keep all data. 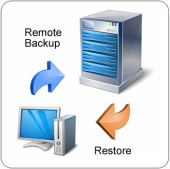 Our powerful Restore features can rebuild (in real-time at the time of restore) a full file set containing all the latest versions of files from multiple backup sets for Full, Incremental, Differential and Bit Backups. THE INFORMATION YOU ARE PROVIDING WILL NOT BE SOLD OR PROVIDED TO ANY OTHER ORGANIZATION. IT IS STRICTLY USED TO PROVIDE YOU A TRIAL/DEMO CD. WE RESPECT OUR CUSTOMERS PRIVACY AND WILL NOT COMPROMISE THAT RELATIONSHIP OR PROSPECTIVE RELATIONSHIP. Offsite SAN helps prevent the loss of critical computer files. Secure backups are performed automatically each night over your existing internet connection. You don't even have to be there! There is no expensive equipment to purchase or media to store. Just use our point-and-click software to select the file folders you want to archive. Scheduled backups are then performed automatically. Offsite SAN comes fully configured and ready to use. Once downloaded and installed, all you need to do is define a backup schedule with files and folders you want backed-up. 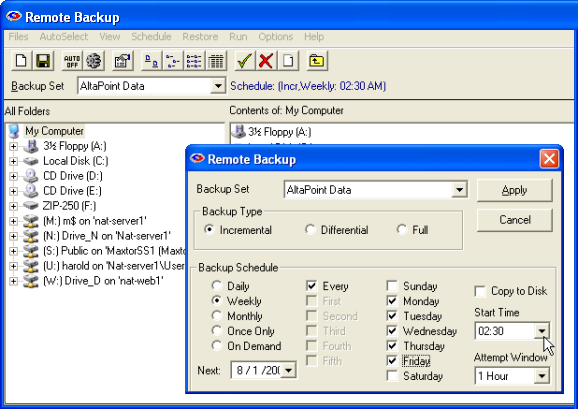 Users can define one or more backup sets to be run automatically at one or multiple times each day. Your initial backup will compress, securely encrypt and backup every selected file to our secure data center via 448-bit Blowfish encryption. Subsequent backups are performed incrementally - meaning only the changes made to the files are sent to our server. Incremental backups greatly reduce storage requirements and Internet bandwidth, thus optimizing backup times and server storage space. Files added to any backup set folder will automatically be sent to the Offsite SAN Server during the next backup. Updated files are backed-up using Incremental binary patching. They are compressed, encrypted via secure 448-bit encryption, transferred and archived for 30 days (user configurable up to 27 years). When you delete a file on your computer, the file (and it's corresponding versions) remain available on the Offsite SAN Server for 30 days (user configurable up to 27 years). You can immediately delete a file from the Offsite SAN Server via the Offsite SAN Client user interface. When you move a file to a different location on your computer, it is treated as a Deleted File in it’s original location and a New File in the new location. Offsite SAN automatically backs up all open, locked and in-use files including those opened for "exclusive access", i.e., Outlook, QuickBooks, RDMS databases, etc. You'll never have to log out or close a program at backup time again. 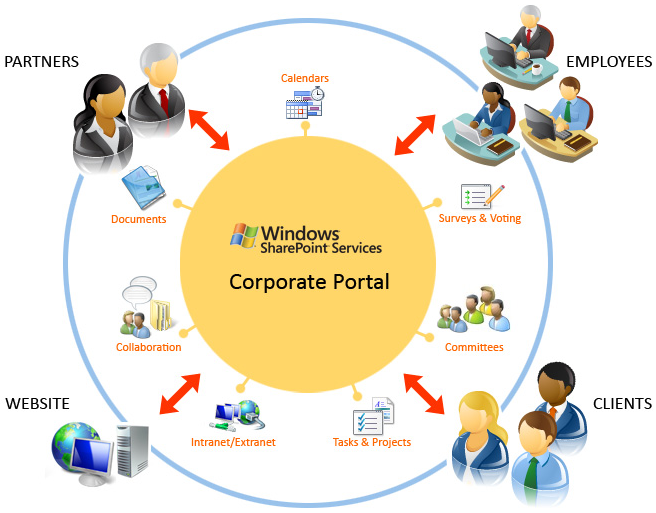 Small businesses and individuals often use Outlook for email, calendar and contacts. Offsite SAN's Open File Backups make it easy to backup all of your Outlook data. Simply include your Outlook .pst files in one of your backup sets. Many businesses utilize QuickBooks to manage their critical financial data. Offsite SAN's Open File Backups make it easy to backup QuickBooks and QuickBooks Pro without having to close the application. Simply include the .qbw (QuickBooks work file) in one of your backup sets. Simply select System State in any backup set and Offsite SAN will back up your Windows System State (Windows registry, user settings, and Windows system files). Offsite SAN will automatically detect and backup Live SQL Server at the bit-level - without having to stop the critical services that support your business. Offsite SAN users have two great options for Exchange Server backups and restores. For disaster recovery, Offsite SAN is great. Simply select the Exchange server and Offsite SAN is setup to backup and restore Exchange. It efficiently sends only the bit-level changes of the full Exchange store to the backup server. While this method can not restore a single email or folder, you can restore Exchange to another server, extract what you want, then import it into the production server. If you want to be able to restore down to the folder/email level, Offsite SAN's built-in expanded features are for you. Note that while handy, this level of granularity increases setup requirements and backups/restores can be less efficient. If Active Directory is installed, Offsite SAN will automatically detect it and enable it to be selected for backup. Offsite SAN provides users with a local backup store configurable to any local or network drive. A restore request will intelligently attempt to restore from the local store first. If the file(s) can not be restored from the local store, Offsite SAN will retrieve the file(s) from the Offsite SAN data center. This methodology greatly improves performance, optimizes bandwidth, and provides yet another layer of redundancy protection for your critical data. Offsite SAN supports onsite backups to CD/DVD media. The encrypted media can be safely stored or transported to our Data Center and copied onto the Backup Server to optimize large volume initial online backups. By default, Offsite SAN maintains the last 30 days of file versions on the Offsite SAN server (user configurable up to 27 years). Users can configure the Offsite SAN client to automatically purge (delete) any backups on the First Backup server older than "#" days. Users can restore any available file version(s) from the Offsite SAN server via the Offsite SAN user interface. Simply select the appropriate folder(s) and/or file(s) and click the "Restore" button. Upon request, each file is automatically combined with the appropriate incremental backups, securely transferred to your computer, decrypted, uncompressed and restored to its original (or optionally temporary) location. While most traditional backup systems do a good job of archiving data, they do little to actually secure it. A ZIP cartridge, CD, DVD or tape can easily be misplaced or stolen. Once in the wrong hands, your confidential data is easily compromised. Fortunately, the Offsite SAN online backup service does not suffer from these shortcomings. Your files are encrypted and stored at multiple, redundant Offsite SAN secure data centers. Even if a fire, flood, or other disaster destroyed one of our data centers, your data remains protected and available, on-demand - 24x7x365. Offsite SAN utilizes the industry's strongest and fastest encryption algorithm for the ultimate in data security and protection. Blowfish is a symmetric block cipher accepting a variable-length key up to 448 bits, making it ideal for both domestic and exportable use. Since it's initial release in 1993, the Blowfish code has never been cracked. In fact, a 448-bit Blowfish encryption key would take 2.1x1096 BILLION powerful computers, each capable of trying one BILLION keys per second to try every possible combination of bits in a 448-bit key. In other words, your data is ultra-secure with Offsite SAN. Each time the client software is installed, a random, unique encryption key is generated. This key is automatically loaded into the backup program and used to backup or restore your data from the offsite storage vault. At installation time, you MUST record the value of this encryption key and store it in a safe place. You alone are responsible for securing and keeping your key private. As this key is completely random, Offsite SAN personnel do not know your encryption key value. If for any reason you need to reinstall the backup client software to recover data, you will need this key. Remember, your password is NOT your encryption key! Without the encryption key, nobody can access your information - not even the employees of Offsite SAN. This provides you with assurance that your data cannot be read by unauthorized personnel. HIPAA has enacted several mandates to improve the access and portability of patient health records while maintaining strict privacy and security. A critical aspect of the HIPAA privacy ruling is Data Protection, requiring compliant backup methodologies to ensure the security and confidentiality of patient records. Health care providers who engage in electronic transactions must observe privacy safeguards to restrict the use and disclosure of individually identifiable health information. Sanders Software online backup supports HIPAA compliance through automated off-site data protection with on-demand recovery, while ensuring strict data security and confidentiality. Patient record confidentiality is critical. Any electronic data transfer and storage must be adequately protected and secure from all unauthorized access. Organizations are required to have a contingency plan to continue operations in the event of data loss. 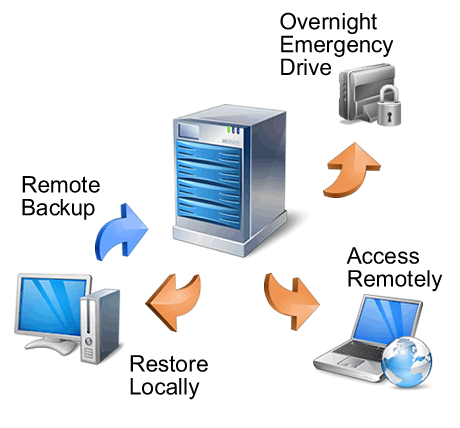 This contingency plan MUST include details concerning the data backup and recovery process, who handles the backup media, the media rotation process, where the media is stored off-site, how quickly it can be retrieved in the event of a disaster, and all other aspects associated with data backups, protection, security, storage, and recovery. Data loss can result in further losses of productivity, patients/customers, and revenue. In many cases significant data loss will result in lost business. Fortunately, the damaging impact of data loss can be negated with a qualified data protection solution as part of your contingency plan. HIPAA compliant information systems require a combination of administrative procedures, physical safeguards and technical measures to protect patient information during storage and transmission across communication networks. As a significant part of your overall contingency plan, Offsite SAN provides secure, automated data transmission and storage services for data backup and recovery. Automated, unattended data backups with built-in notifications. 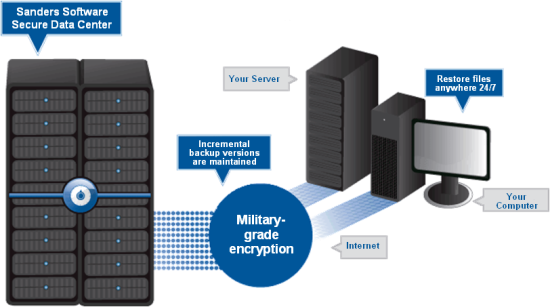 Ultimate data security via 448-bit encryption - data is ALWAYS compressed and encrypted during transmission and storage. Data integrity controls with mutual authentication. Restricted password access - a secret encryption key can be specified for ultimate security, even Offsite SAN can’t get access your data. Off-site storage at highly-secured data centers. Data is mirrored to secondary secure facilities for ultimate data availability. Extended storage is available (HIPAA requires storage for minimum 6 years). On-demand, exact copy data retrieval - 24x7x365. Optional monthly CD or DVD archives are available. No cost or hassles with external devices, media, or offsite storage. US company with the lowest subscription rates in the industry. HIPAA privacy rules provide Offsite SAN and its affiliates with "business associate" rights to limited use and disclosure of the information. Offsite SAN never discloses data unless required by law. Offsite SAN does not access any portion of the backup data unless authorized for customer support purposes. Offsite SAN can be fully prevented from data access by use of the client-side secret encryption key. How secure are online backups? What tasks are required to run a daily backup? Which operating systems does Offsite SAN support? What happens if my connection fails during a backup? Can I use my high-speed broadband connection? What if I turn my computer off and miss a backup? Can I backup my network? Can I backup more than one computer to my account? Does Offsite SAN work if my company has a firewall? How often is my computer backed up? How do I know that an online backup actually occurred? Do I have to install a special Internet connection or other communication equipment? Most small businesses put their lives on the line every night and don't even realize it. With businesses depending more and more on the data stored in their computer, proper backups are becoming much more critical. Online backups accomplish several essential steps that are often overlooked or done improperly by other backup software - especially non-automated tape backup systems. Online backup works basically like regular (tape) backups, with one important difference. Instead of sending backups to a device attached to the computer, online backup works by sending data over your existing Internet connection to an offsite remote storage vault. It does this (usually) at night while the business is closed and nobody is using the computer. It's completely automatic. Using both a tape backup system and an online backup system offers the best of both worlds. Critical files, like billing, customer contact files and databases can be backed up daily using the online backup service. The tape system can be used to create a full backup of the entire file system - including program files - once or twice a month. In this way, the tapes and the drive will last longer and require less maintenance. The online backup system can provide a quick and easy way to retrieve critical files and databases without the hassle of searching through tapes. Very. You -- and you alone -- have access to your data files because Offsite SAN encrypts your data prior to transmission to our offsite backup storage vault. Military-grade encryption technology and a user-defined password (encryption key) ensure that nobody, including employees of Offsite SAN, can access your data. Compare this to the total lack of security on most tape, zip and CD/DVD drives. None! The actual backup process itself is fully automated. Once you have configured the time, frequency and list of files to be backed up into the client software, the actual backup will take place automatically on schedule. All you have to do is keep your PC turned on when you leave the office in the evening. Offsite SAN will work with most PCs, laptops or servers running Microsoft Windows versions 2000, 2003, XP, Vista, 2008 Server and Windows 7. Both 32 and 64-bit operating systems are supported. To ensure a minimum of software compatibility issues, please verify that you have applied the most recent service packs (software patches) to your system prior to installing the Offsite SAN client software. Offsite SAN software client will also backup remote volumes (files from other computers and operating systems) which are visible as a networked drive to your PC. Encryption is basically a mathematical formula that is used to scramble a data file. The only way to unscramble the file is with the proper encryption key. Offsite SAN clients have their own personal encryption key that is known only to them. Unfortunately, encryption keys cannot be recovered. Offsite SAN recommends keeping a record of your encryption key offsite in a safe location. If a transmission is interrupted in the middle of a backup, the Offsite SAN software client will attempt to re-establish a connection and resume the backup from where it was interrupted. Absolutely. This is in fact the preferred method for quickly accomplishing online backups. It is highly recommended for clients with large offsite storage requirements. If you occasionally forget to leave your computer on, this is not a problem. Offsite SAN will simply resume your backup schedule when you power back up your system. Files that have changed since your last backup will be identified and properly archived when it is time for the next scheduled backup. Yes. Configure your Offsite SAN client software to backup files on a networked drive and it will. Offsite SAN customer support is available to assist with this sometimes tricky task. Yes. The number of computers that can be backed up to your account depends on the Package Plan you purchased. Each computer must have its own unique username and password. All computers covered under your account share a "pooled" amount of disk storage space on the offsite backup server. As often as you wish, because you set up the time and frequency that works best for your schedule. The size of your backup, speed of your Internet connection and amount of compressed data being transmitted will determine the length of time for the backup. Backups can be incremental -- archiving only files that have changed since the previous backup -- or full, to backup all of your critical data. Cable modems, DSL and T-1 connections do speed up the process but are not required. Your initial backup and all full backups will take the longest because it requires transmission of all data files in your backup set to the offsite storage - not just the data that has recently changed. Offsite SAN sends you an email progress report at the completion of each backup. This lets you know that your backup was completed. If Offsite SAN experiences any problem with the backup, the log files attached to the progress report email will identify the files that have not been archived or other trouble found. Do I have to install a special Internet line or other communication equipment? No. Offsite SAN uses your existing Internet connection to transmit files to our offsite storage servers. Even though cable, DSL and T-1 lines speed up the process, some Offsite SAN clients successfully use a dialup modem to transmit encrypted data to the Offsite SAN server each night. 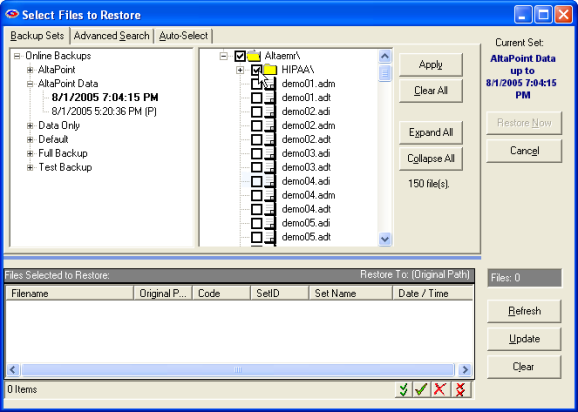 Offsite SAN lets you select individual files or folders for restoration. If you have a catastrophic loss, simply install the Offsite SAN client software on your new computer, connect to the Internet and restore all of your data up to the point prior to the unfortunate event. In order to recover you data, you must have your encryption key or recovery diskette created at the time you first installed the original backup client software. Copyright © 2018 Sanders Software Consulting Inc. All rights reserved.